Dubai: More and more young Emiratis are willing to take up private sector jobs as they seek to widen their horizons in a shrinking job market. 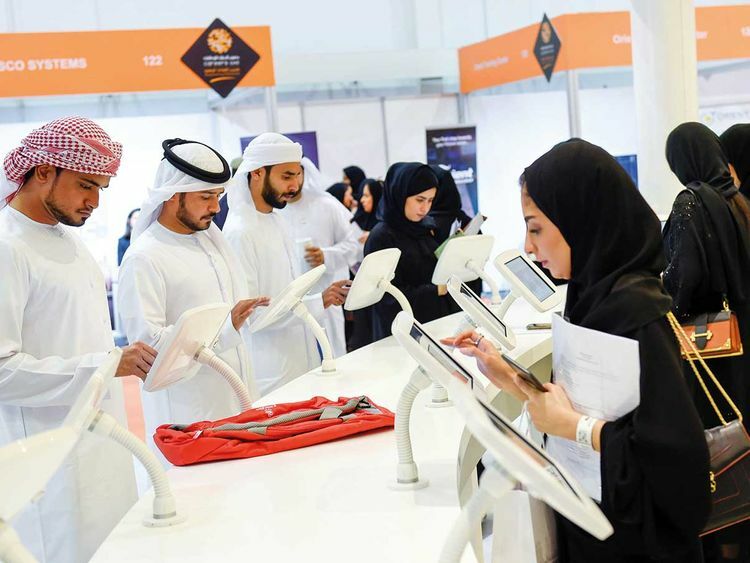 At Careers UAE 2019, a leading job fair dedicated for Emirati job seekers, private sector pavilions seemed busier than before with local youth making a beeline in search of new opportunities. Khalid Ebrahim is only 19 and is currently pursuing a degree in mechanical engineering, but he is willing to juggle his class with work in order to gain valuable experience before graduating out of university. “I am here in search of opportunities related to my field. I am particularly looking at the private sector, where I can learn on the job and through experience which would add to what I am learning at the university. I am hopeful of finding something meaningful,” said Ebrahim, a year one mechanical engineering student. Another jobseeker who is willing to join the private sector is Fatima Ahmad from Dubai. The 22-year-old IT professional said, long hours at work, which is one of the reasons that drives Emiratis away from private sector, is not any issue for her. “I am looking for jobs in the IT field in both public and private sector. My main focus is to find a job that gives me as much experience as possible so that I can improve my knowledge. I don’t mind working long hours and joining the private sector. I have applied for many jobs and I am really hoping I get some calls,” said Ahmad. And it’s the not just the fresh graduates who are warming up to private sector, even experienced professionals are looking for a shift. Ahmad Sharief has more than a decade’s experience in oil and gas operations with a government firm and the 30-year-old is now looking to explore new avenues. “I feel private sector jobs are more challenging and offer more opportunities for a career growth. I want to grow as a professional and achieve new milestones and I feel private companies have better work environment, giving more chance to move forward,” said Sharief, who is from Abu Dhabi. Sharief’s friend, Ashraf Ali, another government employee on a look out for change, agrees. “I am working for a government entity but now I want to move on. I am looking for opportunities in private companies that will help me grow as a professional and give my career a new direction, but so far I haven’t found anything, hopefully soon,” said Ali, a 25-year-old communications professional. Though not everyone is keen for a shift, more Emiratis are showing a level of flexibility that wasn’t seen before. “I am searching for a job that matches my skills in either the public or private sector. I am a university graduate and I specialised in early childhood at Zayed University. I have heard a lot about programmes for fresh graduates and I am open to joining them in the private sector. I am also looking at other sectors and do not mind getting a job with 9am to 5pm timing. My only restriction is a job with morning and night shifts,” said Meera Haji, a 22-year-old graduate from Dubai. But, there are still those who feel more comfortable in a government job, like Khalid Mohamad Abdullah from Sharjah who is hopeful of landing a public sector job. “I hope I can find a job here. I graduated with an IT degree and I am interested in joining the public sector so I can get a lot of experience. I have done two internships and I would prefer to get a job and not enter one of the fresh graduate training programmes. I am also working on my English because that is important in any interview and in any job,” said the 24-year-old. It seems limited opportunities in the government sector and changing realities of life are finally forcing many Emiratis to change their job preferences.